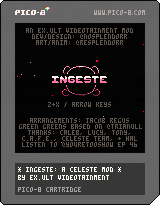 EX.ULT VIDEOTAINMENT presents a mod of the Pico-8 version of Celeste that replaces Madeline with everybody’s favorite hungry pink blob! Instead of dashing and wall-jumping, you’ll run, flap, float, and inhale your way up the mountain. A spring breeze is blowing flower petals across the slopes. Collect optional Maximum Tomatoes, just for fun. We made minimal edits to Celeste’s level designs to allow for 100% completion. Follow EX.ULT VIDEOTAINMENT here on Itch or on Twitter @EXULTgames to see more cute game things we’re working on! Save this Pico-8 Cartridge to play it locally in Lexaloffle's Pico-8! I finally finished celeste. In original pico-8 version last few levels were impossible for me. Thank you.